At The ROYAL ALBERT HALL, LONDON on 8th April 2004 after some 15 months of planning with PAUL WELLER, RONNIE WOOD, PETE TOWNSHEND, STEVE ELLIS, MIDGE URE, OCEAN COLOUR SCENE amongst the artists assembled to perform to a sell-out venue and to pay tribute to a man who co-wrote many Mod anthems such as “Itchycoo Park, All Or Nothing, Here Comes The Nice, My Mind’s Eye” to name just a few. 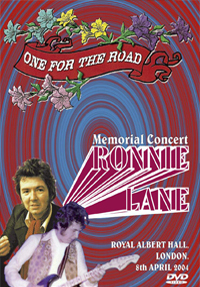 RONNIE LANE was the creative heart of two of Rock ‘n’ Rolls quintessentially English groups, firstly during the 60’s with The SMALL FACES then during the 70;s with The FACES. After the split of the Faces he then formed SLIM CHANCE and toured the UK in a giant circus tent as well as working in the studio with ERIC CLAPTON, PETE TOWNSHEND and RONNIE WOOD. 5,500 fans looked on in awe at The RAH as the superb evening’s entertainment ended with “All Or Nothing” featuring a surprise appearance by CHRIS FARLOWE on lead vocals. ...the many musical highlights aside, what delights here most is the warm vibe, for Lane was obviously a man who was much loved by his former colleagues as well as someone who was a hero for so many in the audience. Ronnie Lane was truly one of rock's unsung heroes. This production isn't about flashy photography and over the top stage shows, it's just about the man and his music. One For The Road is a fitting tribute to someone whose life was cut far too short. Released on Angel Air Records. Pete Townshend and Paul Weller seized possession, by their very presence, of a good-natured capacity crowd that, fading into the Kensington twilight afterwards, agreed generally that it had participated in one of the 'greatest nights anyone could ever remember'. This DVD is a wonderful way to remember a great evening at the Royal Albert Hall and a fitting souvenir for those who were there. Those who could not make it will enjoy hearing and see the concert for the first time. Great fun. Let's do it all again one day. Ronnie Wood, Pete Townshend, Paul Weller and sixties icons Steve Ellis and Chris Farlowe all played their part in the success of a lengthy set as they helped to breathe new life into memorable Lane creations such as 'Itchycoo Park', 'How Come' and the beguilingly bucolic 'The Poacher'.